Ever since Windows 10 came out, Windows 7 and 8 users have been bombarded with upgrade notifications, thanks to a little Windows icon in their system trays called GWX (“Get Windows 10”). Here is how to remove that icon and avoid the pushy notifications. This article was originally published in June 2015. Since then, a new tool has come out that does a more straightforward job of preventing unwanted Windows 10 updates, so we’ve updated the article with information about it. 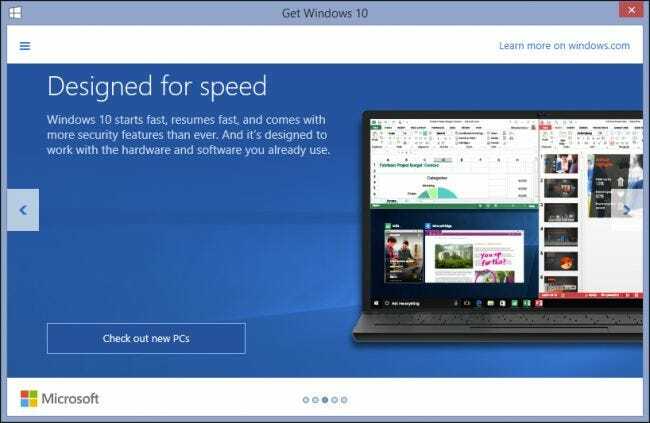 We’re all aware of Windows 10 here at How-to Geek, and in truth, we actually like it–it finally fixes most of Windows 8’s ills, and brings some handy new features. But we can’t go a day without hearing about Microsoft pushing the upgrade just a little too hard. If you don’t want to upgrade to Windows 10 right now, and you’re sick of the nagging, here’s how to fix it. The “Get Windows 10” (GWX) upgrade is an icon and dialog that resides in user’s system trays, which has alarmed quite a few people, who aren’t sure if it is some kind of trick or malware. Let us say with no uncertainty, it is not, but it is a little underhanded and annoying on Microsoft’s part. The “Get Windows 10” icon opens a dialog that hypes the upcoming Windows upgrade and determines your availability to receive it for free. When you click this icon, a dialog will appear, which will determine if your PC is Windows 10 ready, if you’re eligible to upgrade for free and, of course, regale you with all the wonderful things Windows 10 will mean to you. 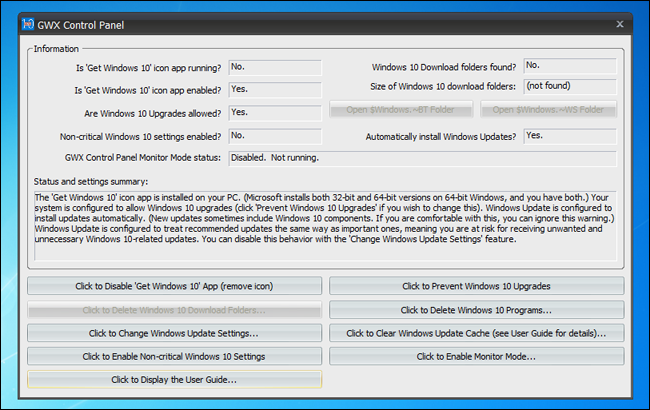 This new icon and its resulting dialog are actually part of an application that appeared in late April 2015 as a recommended Windows update (KB3035583), and which has undergone several revisions to facilitate the upgrade process as well as skirt efforts to remove it. You will see this update in one of two ways, if you have the “Give me recommended updates the same way I receive important updates” box checked in Windows Update, you will see KB3035583 as an optional update. If you have “Give me recommended updates the same way I receive important updates” unchecked, you will see KB3035583 as an unchecked but italicized update. This update installs the Get Windows 10 app that helps users understand their Windows 10 upgrade options and device readiness. For more information about Windows 10, see Windows 10. Further, in the most recent iteration of KB3035583, if you have it hidden, it will now be unhidden. The long story short KB3035583 is annoying and it’s unreasonably difficult to easily make it go away. Basically, KB3035583 simply lets Windows Update pester you about upgrading to Windows 10. 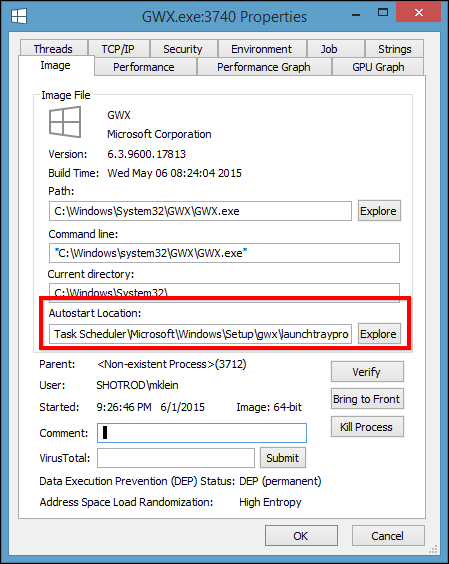 KB3035583, otherwise known as GWX, is an executable that starts with your system via the Task Scheduler. 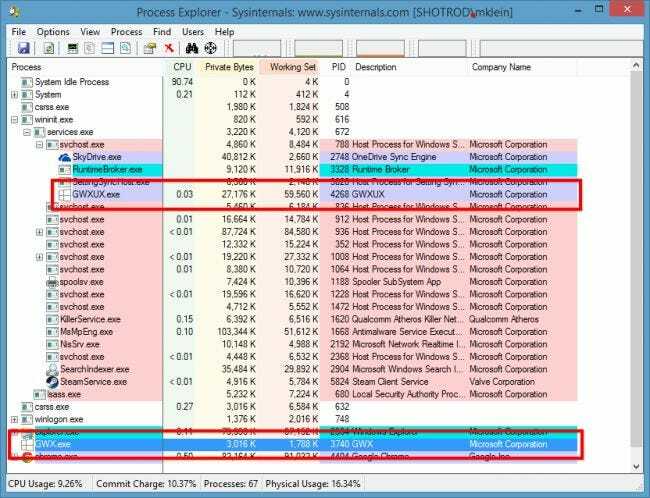 GWX.exe is the system tray icon. When you click the system tray icon, it spawns the application “GWXUX.exe”, which is the upgrade dialog discussed earlier. To make this icon and its notifications go away, Microsoft unhelpfully recommends hiding them. This works for the current session, but restart your system (which happens from time to time), and it reappears. You can’t right-click on the icon and tell it not to bug you anymore, and while you could remove its entry from the Task Scheduler, that doesn’t actually remove the GWX application from your system. More importantly: Just because it’s hidden doesn’t mean it won’t pester you about upgrading. If you don’t want this item on your system, we recommend removing the update altogether. We don’t feel it is critical to upgrading to Windows 10, and even if it is, you can always go back into Windows Update and reinstall KB3035583, or you can use the following method and forgo all this rigamarole altogether. In the 11 months since we first published this article, the Get Windows 10 (GWX) system has annoyed countless Windows 7 and 8.1 users, and in that time, Microsoft has maneuvered time and time again to get 10 installed on as many machines as possible. Often it has done this despite these users plainly not wanting this update, period. So, what follows is what currently appears to be the absolute best way to do so, by using a small (81KB) freeware tool called Never10. 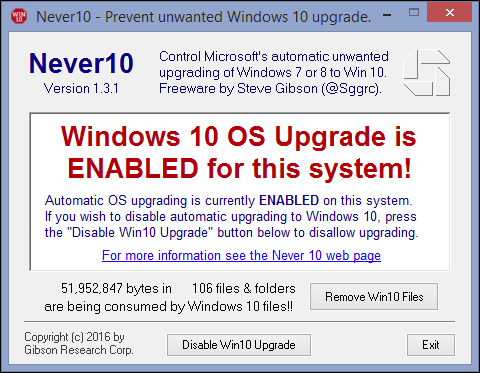 Never10 was developed by well-respected security researcher Steve Gibson, which means it’s trustworthy and contains no adware, viruses, or other assorted malware nastiness up its sleeve. Basically, it acts as a frontend for Microsoft’s hidden settings that prevent the Windows 10 upgrade. Let’s dig in briefly and show you how Never10 operates. Firstly, here’s the infamous GWX icon in the system tray, which when right-clicked will give you various options to educate yourself about or simply upgrade to Windows 10. This icon will occasionally bug you with reminders that Microsoft thinks it would be a great idea to upgrade your PC to Windows 10. We want this behavior to stop, so we’ll use Never10 to do that. 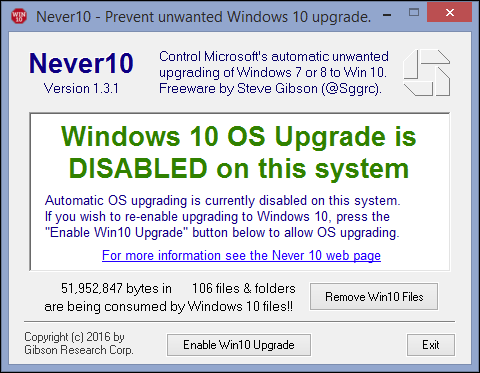 First we cruise on over to the Never10 homepage, and scroll down to download the Never10 executable. Alternatively, you can actually go directly the Never10 freeware page. Never10 doesn’t require installation; it runs as a standalone executable. So just double-click it to start it up. Never10 will tell you whether the Windows 10 upgrade is enabled on your system. If it is, click the “Disable Win10 Upgrade” button. Upon clicking that button, you’ll be presented with the following confirmation and you shouldn’t be bothered by GWX again, unless Microsoft once again attempts to circumvent this. Keep in mind that the GWX system tray icon may not immediately disappear from your system tray, instead continuing to reside there and even offering to help you with the upgrade if you click on it. We discovered however that it did indeed go away after a simple restart. You can also click the “Remove Win10 Files” button to remove the upgrade files from your system, which should free up some hard drive space. However, according to Gibson, Windows will remove these files automatically eventually anyway, so it doesn’t really matter if you remove them now or let Windows do it later. There are a couple of instances where you might see a different outcome. If you try to run Never10 on a system other than Windows 7 or Windows 8.1, it will inform you that it is intended only for those two systems since they are the targets of Microsoft’s upgrade path. Also, if you try to run Never10 on a system that doesn’t have the latest GWX files, Never10 won’t work, but will offer to download those files so it can properly do its job. This seems counterintuitive, but due to the way Never10 works, it makes sense. It doesn’t actually remove GWX completely: it just prevents it from ever running, using Microsoft’s built-in hidden settings for doing so. There is another program, called GWX Control Panel, that performs a similar function–and we recommended it when we originally wrote this article. If you really hate GWX and want to remove every trace of it from your system, GWX Control Panel will allow you to do so. It’s a bit more complex than Never10, and its extra features aren’t necessary for most users. However, if you’re tech savvy, and you want full control over the entire process, GWX Control Panel is another option. For the vast majority of users, however, Never10 is all you need. That said, installing a separate application as a recommended update is a sneaky way to go about ensuring user adoption. Add to that the fact that there’s no simple way to disable the GWX.exe application other than removing its autostart line from the Task Scheduler or uninstalling it through Windows Update, and we’re further puzzled at Microsoft’s reasoning and lack of transparency. In the end, whether you feel this update process is helpful or whether you can make your way to upgrading to Windows 10 all by yourself will simply depend on how you’re used to doing things. Others may choose to do a clean install and for that, updating through an existing Windows install won’t even apply.